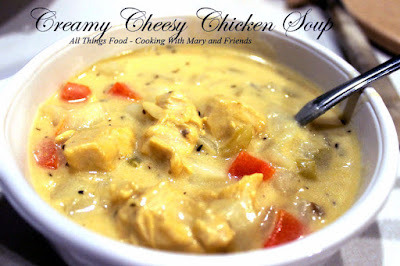 Since my husband loves creamy soups, I set out today to make this Creamy Cheesy Chicken Soup! Oh yes, it is thick, stick to the ribs goodness! Melt butter in a large stock pot and saute' celery and onion 5 minutes over med-low heat, stirring frequently. 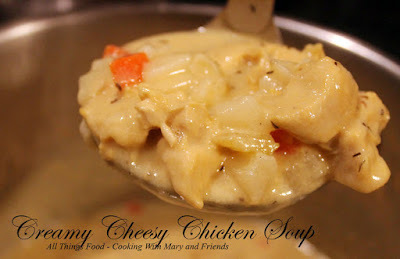 Stir in flour and whisk in chicken stock and milk until thoroughly blended. Add garlic powder, pepper and thyme leaves. Stir in carrots and chicken and allow to cook over low heat about 20 minutes or until vegetables are tender. Add potatoes and cook 15 more minutes; add cheese and stir until well blended. Cook over med-low heat an additional 10 minutes or until well blended. Adjust seasonings and add salt and pepper to taste. Serve hot with crusty bread or biscuits.